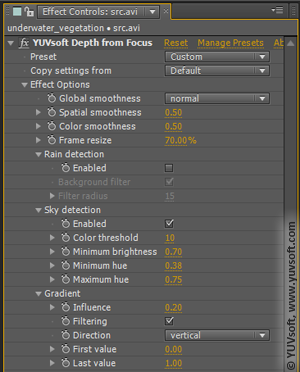 The YUVsoft Depth from Focus plugin saves you time by automatically generating depth maps for input frames; you can rely on it in cases of either in-focus foreground objects or out-of-focus background areas. But the key feature of this tool is its ability to process especially difficult frames (scenes with rain, snow or explosions) when you are aiming to create spectacular 3D video. Manual processing is a luxury you can seldom afford, and other automatic tools often yield unsatisfactory results in such difficult cases. 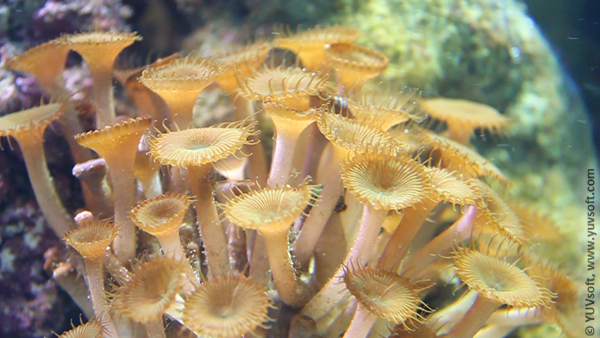 Depth from Focus offers powerful capabilities, as the underwater footage below exemplifies. As you can see from this example, even the depth map generated using the default settings looks good, but closer examination shows some defects: the light patches on the plant’s stems were incorrectly identified as the part of the background. YUVsoft Depth from Focus helps you achieve high-quality depth maps in difficult scenes, such as underwater footage, without the burden of manual processing. Even the result from using the default settings, which is achieved with just a few mouse clicks, is impressive. But you can adjust a number of parameters to gain optimum results when you need them. 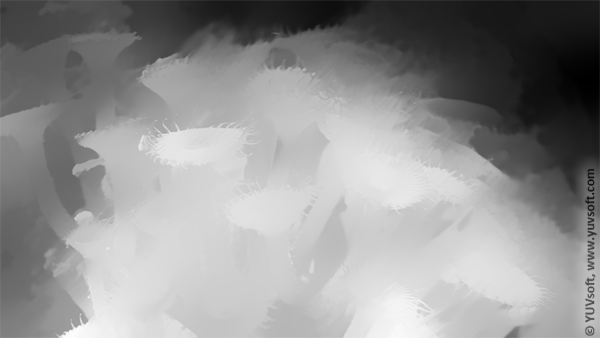 You then can use the results as key frames for YUVsoft Depth Propagation. 2D–to–stereo 3D conversion process description. Depth from Motion plugin for Adobe After Efects.